Nobody by Sarah M Anderson – Male lead that is sooooooo damaged that you want to cuddle and then do all sorts of naughty things with. His reaction to accidentally spanking his heroine was heartbreakingly sweet but seeing his joy in finding someone that could really see him was amazing. Sarah knows I was just chomping at the bit for him so I am so happy we all got to read his story finally. Taking Him and Having Her by Jackie Ashenden – These two really should be read back to back. First one has a VIRGIN hero who needs someone to really push him to fully accept what happened to him and accept his demons. This one also includes little sister of best friend so ya know that is going for it. The second one is the older brother of the heroine in the first one and her virgin best friend. There might be a bit of mastery involved and one of my favorite grovel moments. The grand gesture was amazingly beautiful and the pair truly are wonderful to read about even as they break your heart. Living in Shadow by Jackie Ashenden – This is another read by an author who knows I am addicted to her and knows to just send me what she’s got. I’ll admit to being very willing to read her particular forms of WTFery and gladly inhale her stories but this one deals with something that is darker than most. Our hero is someone that deserves every bit of happiness after the horrors he witnessed and participated in as a child. I’ve got the next in this series loaded on my Kindle for a birthday present so YAY!!! Linger by Lauren Jameson – This was a recent read but DAMN was it great! Alpha cowboy who craves submitting in the bedroom. All I can say is I wouldn’t mind having a man like that in my personal life. DAMN DAMN DAMN was this HOT. Unbroken by Maisey Yates – While there was gratuitous waste of bacon in this story I can’t say I blame them for it. This is two best friends who have been good at ignoring their chemistry until it finally explodes in to something real and lasting. I loved seeing these two dance around everything. Falling for Max by Shannon Stacey – ADORABLE!!! *falls over giggling* I have to say that this is a bittersweet item in the list. I loved Max but this is the last Kowalski story for now and that is just something that makes me want to weep. I love every one of these stories and will miss seeing more but I have faith she’ll visit again. The Saint by Tiffany Reisz – I swear I love her stories and this one delivers the expected mind fucks that she is so good at. I found myself cursing as I wondered if she was going to be so cruel to us but I loved the story and the new person introduced to us. Thanks again Tiffany for a masterful read. The Mark of the Tala by Jeffe Kennedy – Loved this entry… reminded me a lot of the fantasy stories I read growing up with a bit more romance than they had. I have an ARC of the second book sitting next to me right now and I’m looking forward to seeing if Jeffe can change my mind about this sister. Wonderful world, characters and exciting storyline to work thru. Mercy by HelenKay Dimon – Smoking hot couple that can’t completely deny what they feel for one another no matter how much they try. With all the lies and secrets between them can they make it work? Also has one of the hottest male/male secondary romances around. I look forward to reading Only this weekend. So…. 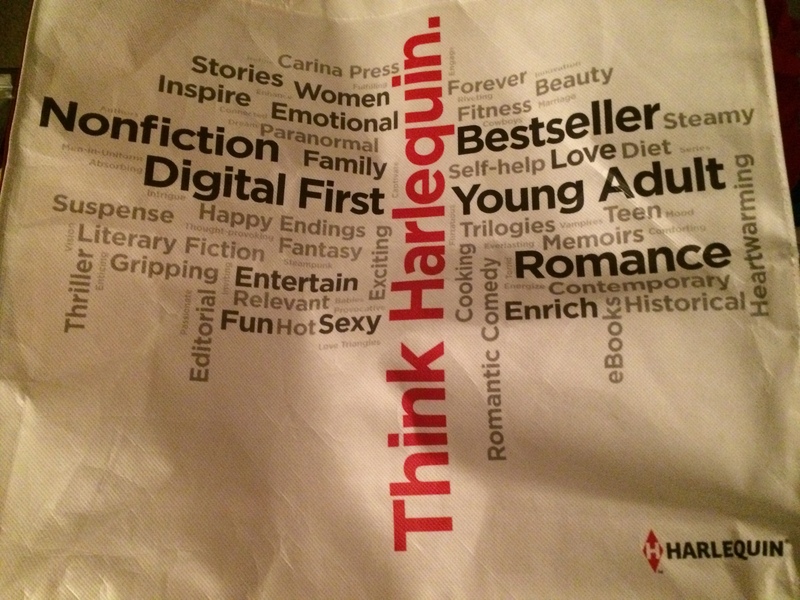 Today’s giveaway package includes one of the titles above – Nobody by Sarah M Anderson (signed) along with more titles from her and Jules Bennett plus a Harlequin bag. To enter just comment below by telling me a title or two that you’ve adored this past year. Entries must be received by 11:59 pm US Central on September 19,2014 and this contest is open internationally. Happy Blogaversary!! Congrats on two years blogging and on all the wonderful life changes! I have Taking Him and Having Her by Jackie Ashenden and Mercy by HelenKay Dimon on my TBR pile.